Drawing has always been a large undivulged hobby of mine my entire life. I have doodled and sketched secretly, without instruction, on notebooks, sketch paper, napkins. I have sketched more than I have watched Tv or done homework. I love drawing and always will, i hope. This class has only intensified my liking of it. The time it took to draw some of these drawing were expansive and encompassing, and thus a little exhausting, but in the end, I am grateful for the push. I would always draw when I wanted, quitting as soon as I lost interest, but now I have a greater appreciation for finishing works to a certain extent. I have always been a visual person. In school, I would learn most form hand on activity and the conceptualization of the various diagrams that described neuronal synapses to historical trends of silver accumulation. Rather than a list of directions, I preferred a map. Naturally over writing, I always chose drawing. And even beyond this class, I plan to utilize what I know about art and my experience in it in my future plans of marketing and teaching. The fiction drawing I enjoyed drawing the most. In addition to the challenge of capturing a particular focus and its entire environment into a large sheet of paper, I loved having that power to transform such reality into a playful fiction. It was some what exhilarating. While working on the last three drawings, I found a new reason to enjoy drawing. 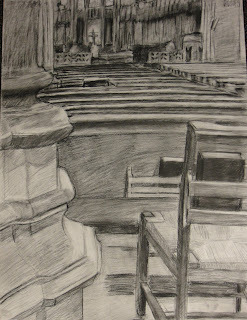 Before doing the assignment, I had never really sat outdoors and drawn for any substantial period of time (i.e. more than an hour or so). My experiences with drawing before this class mostly consisted of drawing in the classroom or in my house. I had never really drawn out in public before. Working on these drawing over many days and often for hours at a time, I got to experience my subject under a broad range of lightings. It is nice to see how a scene interacts with light and how it changes as the sun sets. Depending on the lighting the Nasher, Perkins and the Crowell clock tower could look completely different. I felt like Monet must have when he obsessed over his Thames series. When drawing the Nasher, several people stopped on their way to or from the museum to look at my drawing. I especially enjoyed when a group of little kids gathered around me and asked me how I learned to draw. Drawing Perkins offered a similar experience, as a few people stopped to watch me draw. One man even took several photographs of me. Yet this last assignment, because of my choice of location (sitting in the grass right next to the sidewalk on the main west campus quad) was by far the most “public “ of my setups. Over the course of the roughly seven days I spent sitting out working on the picture (spaced over three weeks), I must have received around 50 comments from people walking by. At first I found it awkward drawing on such a main drag, but it proved to be rewarding. The interactions I had with these people – some students and others adults – ranged from a simple thumbs-up to inquiries about purchasing my work. Some comments seemed to come from fellow artists. For example, one older man talked to me about a drawing he had once made in Europe. However, I really appreciated the positive feedback from people who didn’t identify themselves as artists. It was so nice to see athletes, members of the dining staff, professors etc., appreciating art. Some even told me that they had seen me working the week before and really liked how the drawing was coming along. Some of my friends told me they never new I was an artist before. I drew with headphones on, but whenever I noticed somebody stopping to watch me draw, I would take them off in case he wanted to talk. It was very refreshing to be able to share my art with people in such an active way. Over the summer I spent a lot of time cooped up in my attic painting and getting ready for a show I had in August. Although the show gave me a chance to receive feedback and share my artwork, it was much different than having people actually watch me draw. Of course sometimes I prefer to draw in private. Yet now that I’ve had this positive experience I’ll definitely consider going outside to draw more often. Sometimes I find it unfortunate being a visual artist, as we don’t often have opportunities to “perform” and get immediate responses. I think I’ve found a good compromise. The following paragraphs are disconnected, separate thoughts and should be read as though they were separate entries/blog posts. While I drew and colored extensively as a small child, ever since I taught myself how to paint in 4th grade, I have primarily focused on this form of art. For me, the appeal of painting was that I could blend colors and create realistic gradients in a way that is far more difficult to draw. Also, when I really began painting, I was primarily producing art on useful objects as gifts for other people. As such, wooden boxes and picture frames lent themselves to being painted. In high school, while I did take a variety of courses including the 3-term pre-req studio course, drawing, printmaking, and a 3D seminar; I spent the most time (3 semesters) in various levels of painting courses. During my senior year, I was often incredibly impressed by the work of my peers who had chosen to focus on drawing and since then, I have felt the need to develop my own ability to draw. I believe that taking this class has sharpened and refined my not only my drawing skills but also my overarching capability as an artist. As he reviewed my work at the beginning of the term, professor Fick asked if I was a painter as he felt I had a “painterly” style. As he has mentioned my style a few times during the term, I have wondered how my approach to drawing has made my style painterly. Is it the various techniques that I tend to use to apply and blend the medium? Are my drawings “looser” or less focused on clean, geometric lines? For such large-scale drawings, I prefer to use charcoal because it produces a much greater range of values. Subtle changes in shading that can be produced with graphite are better suited for small, detailed work, in my opinion. 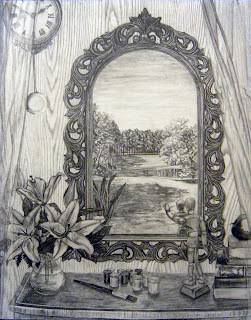 Also, given the relative size of a graphite stick or pencil, it is rather impractical to cover large areas that need dark values especially compared to using a stick of pressed charcoal. I prefer to spend time and effort working on focal points of my drawing rather than working in endless crosshatching to get a dark area (especially when it is a background or rather unimportant element). Charcoal is also much easier to blend to create subtle shading and gradients without harsh lines that graphite can leave behind. I believe that my preference of charcoal with regard to blending, shading, and the ability to cover large areas, has quite a bit to do with the fact that I also paint. When I searched “drawing” and scanned the Wikipedia page, I read through the list of mediums/instruments: “graphite pencils, pen and ink, inked brushes, wax color pencils,crayons, charcoal, chalk, pastels, markers, styluses, and various metals”. Reading through just this list makes one start to wonder: where is the line between drawing and painting? Oil pastels can easily be smeared and blended on the page in the same way that paint could. Why are inked brushes considered a drawing instrument rather than a painting instrument? If there are encaustic wax paints and wax pencils, what makes one for drawing and the other for painting? It seems to me that drawing and painting are actually part of a continuum; however in academic settings, we focus on very different aspects of the “separate” principals. As an artist, I am very focused on the meaning, narrative, or theme of a piece as I work. When Professor Fick mentioned that we should try to include some sort of quirky or nearly surprising elements into our early still life drawings, I was excited to include something subtle but perhaps amusing to a careful viewer. I arranged this still life to reflect my enjoyment and involvement in sailing. I grew up boating with my family, but my father’s intense passion for sailing has inspired my own love for the sport. Recently I’ve sailed on a wooden schooner from Boston up to Nova Scotia and back as a student crew member (2007;Ocean Classroom program), I was the Vice President of the Duke Sailing team for a year and a half, and spent this past summer working as a sailing instructor at a girls’ overnight camp in Vermont. The still life includes items that I would take to go out to sailing practice: my very broken-in, boating Sperry Top-Siders, a small canvas bag, Duke Sailing shades, and my car keys. The careful viewer will notice my mini Sperry key chain. I am very curious as to when humans develop the ability to draw and produce art. Last spring, I took an Intro to Psychology course in which we talked briefly about language development in humans. We were told that human’s “language centers” were responsible for developing sense of time, sense of self, and (of course) ability to communicate. These three things are essential to the creation of art. The sense of self and one’s relation to and understanding of others and their environment is necessary to create and understand the representational nature of art. I imagine that the development of a sense of time also develops one’s sense of space – concepts that factor into creating artwork. Art is essentially a means of external expression, which is, in turn, a form of communication. Thus, I speculate that one’s ability to create and understand art is linked to the development of the brain’s “language centers”. Chart describing "Drawing Development in Children"
Drawing is one of those things that I've just always done. I did it before I could even say the word. My parents never told me to do it, and I never really took a class until now. For me, it satisfies an inner need, not necessarily for other people to enjoy. The thing is, I get an idea in my head and it stays there in the realm of fantasy. So instead of letting it rot up there, I have to put it down on paper to solidify it in the real world. It's a fundamental need to transform the blank emptiness of a piece of paper into a solid and clear expression of idea. This way, my idea can always remain, crisp and clear rather than as a collection of hopes and possibilities in my cranial cavity, where it is subject to change and outright forgetfulness. It was only until other people started positively commenting on my work that I started to understand that this skill could be useful for various aspects of life. The problem is, drawing is a highly introverted and antisocial activity, so I stopped for a while because it seemed like other people were more important than my own needs. However, at Duke I realized that there is a generally higher appreciation of the arts in all of the varieties. Because of this, I resumed activity and actively treated drawing like a skill to be improved and less like a personal catharsis and mental emptying. Jumping in with both feet made it so I could pursue my hobby more devotedly, and even let me get good enough to start scribbling cool looking things all over the walls of my apartment for all to enjoy, in a way that's much less individualistic and introverted. This also led me to start exploring the canvas-like qualities of buildings (aka graffiti) to better understand the practice of social art. And so I must thank Professor Fick for helping me get back on my feet, so to speak, and hopefully learn to run. Drawing is a very personal experience. It allows you to convey your own perspective of a thing that is seen by the public. It is a combination of your interpretation of a subject, your abilities, and how you want the rest to see it. At least for me, it gets very frustrating sometimes. I feel like I am lacking ability – or at least technique and experience – and so what I end up drawing turns out to be very different from what I had imagined in my mind. I also feel like it tests my patience. Sometimes I wish I could include the texture of the brick wall in my drawing, or actually draw the leaves of the trees; like you would do it in a photo-realistic drawing. So since I don’t have the patience or the ability to do that I just end up using dramatic shades and try to pull the whole thing to the opposite side. I think my preference of charcoal over pencil is a result of my impatience. It just comes more naturally to me and requires less effort; I feel like I can concentrate on the drawing itself rather than technique. For some reason, I just find soft pastels magical. Their colorfulness and smoothness remind me of a child’s imagination; a world in which he could create endless things, without worrying about their connection to the real world. I want to be that child, but I can’t do that either. I feel like I’m torn between ability and creativity; because I haven’t excelled in neither of them. I can’t be free as I would like to be and I can’t pull myself together and produce something that has an actual technical value. I love drawing – it really is one of my passions; but not knowing where I stand limits me and I just feel like giving up. Art is supposed to be limitless; it is supposed to be an area where you can extend beyond the boundaries set by the real world. So why do I end up feeling like I’m in a cage when I know that there are endless things that can be done with a piece of paper and a pen? I want how I feel when I touch the soft pastels to be visible in the drawing; but I don’t know how to do it. Drawing is a very personal experience for me but it just becomes too frustrating sometimes. Who do we draw for? In my years of making art, I have experimented with oil pastels, chalk pastels, acrylic paint, oil paint, water colours, pencil crayons, candle wax, thread, linseed oil, food colouring, incense sticks, blood, tears, saliva and even urine. I have printed, sewn, painted, woven, sawed, dripped, scratched, moulded and drenched. I have photographed naked people and even been photographed naked. I hung a bed from a four story building. Despite all the mediums I’ve been able to explore, nothing compares to the feeling of charcoal on paper. Drawing has always been a very profound form of catharsis for me, and since the day I discovered expressionism I have put pencil to paper to confront emotions, events and ideas. Drawing is one of my primary modes of communication. You may say its terrible - technically inaccurate and lacking in all the fundamental skills required to constitute a legitimate portrait. Now consider that she did it without looking at the page. I’ve begun to think about how far we can put our own regulations on art, and drawing in particular. If we consider a duck and a gun to be “random”, does that make them meaningless? Does the artist fail if their audience disagrees with the relevance of their subject matter? And consequently, who do we draw for? This may be considered frivolous to some, but I create art according to how I feel. I cannot read a set of criteria, sit down and construct a piece of artwork according to someone else’s rules. It’s perhaps for this reason that I would plan out a piece just as we’d been told and then two days before the due date everything would change, because I’d had a revelation, or something had hit me hard that needed to be put to paper. All the drawing I’ve done previously has been abstract, and for the past two years I’ve been able to draw with complete freedom. These 90cm x 90cm canvases are charcoal drawings from my last exhibition in Hong Kong talking about the degradation of the senses, and what effect that would have on our perception and judgments of others according to race. While technically they cannot be said to have cast shadows, perfect tonal range or even structure, they carry a message in a form beyond the barriers of words, and that, for me, is the true power of drawing. When I was little, one of my favorite classes would always be art. It was a class where I could relax and draw, taking a break from my academic studies. However, in high school, as I began to take classes in art, it became something more than just a break of stress-relief/recreation; it became something I clearly took pleasure in. I first thoroughly enjoyed/appreciated drawing during my sophomore year, when my art teacher forced us to draw our sketches using pen. At first I hated it because I was so accustomed to sketching in pencil, but quickly soon after, I began to prefer sketching in pen. There was just something about it - a cleaner look - that made me favor using pen. Since this class uses predominantly pencil and charcoal, it's been a nice refresher of techniques I've forgotten over the years and a great learning experience of things I've never received any formal training on. Within this semester, I've learned a great deal of new knowledge and my perspective on drawing has expanded. Going into this semester I was extremely excited to take a drawing class that I believed would help me relax and take a break from more stressful work in other classes. Ironically, drawing probably ended up being almost as stressful as these other classes and my response to the work that we did was a lot different than I had expected. I always believed that drawing was my thing because I was always a crafty and creative little kid and I guess I believed that this creativity would continue throughout my life even if I had not been continuously sketching throughout the years. I was very wrong. Creativity is very different as a child than it is as you grow older. I now believe that if I were to be a good artist and enjoy what I was doing and produce pieces that I like, I would have to put my whole self into art and not just take it as a college class. If drawing is something I have to do, I will not enjoy it. It is not to say that I did not enjoy taking this class. 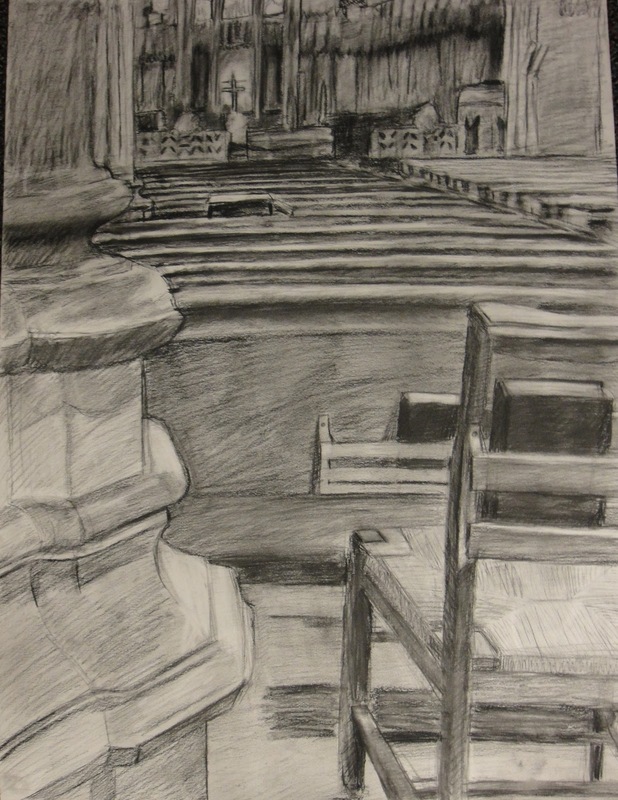 I was happy that I was re-introduced to techniques such as subtractive drawing, shading and negative space drawings. However, because I was “assigned” to do drawings that focused on certain techniques I began to dislike what I was doing and it became something I had to do, rather than something I wanted to do. Art is a way to freely express yourself but taking an art class impedes on this notion, I didn’t feel like I was “free.” With rubrics and deadlines I was rushed and was forced to check my work to see if it had all the elements that it was supposed to. I know that you cant take these elements out of the class because the point is to practice techniques, I just don’t know if it was the best choice for me. Even with our sketchbooks I was not inspired or excited to create my own pieces, it was more of a, I have to get 48 sketches in by the end of the semester thing. It’s sad to say but I think drawing and I have grown apart and as the years go by I think this will continue to happen. However, I still am excited to use my creativity in other areas of my life. Whether it be in other forms of visual art, or applying it to other subjects that I am interested in, I am realizing that I still am a creative person, just in a very different way that I used to be. I think taking this drawing course has been a bit a of challenge for me. I don't spend much time drawing, other than doodles. In my high school, our art course weren't very focused on any one medium. Instead we explored as many as we could and if we felt more comfortable with certain ones then we usually stuck to that one medium when doing bigger projects. For me that was painting and creating stencils. Naturally drawing didn't become a strong point of mine. Even outside of class, I was not able to really do much art especially around senior year when my schedule became more intense. Thus, when I began my college career I decided I would try and take some art courses. One of which was this drawing course. At first, I was not all too confident about taking the course. As I said, drawing was not really a strong point. I had initially taken the course as a prerequisite to take the painting course in the Spring. I thought that drawing will perhaps improve my skills in painting and how to work with the tones of hues better. 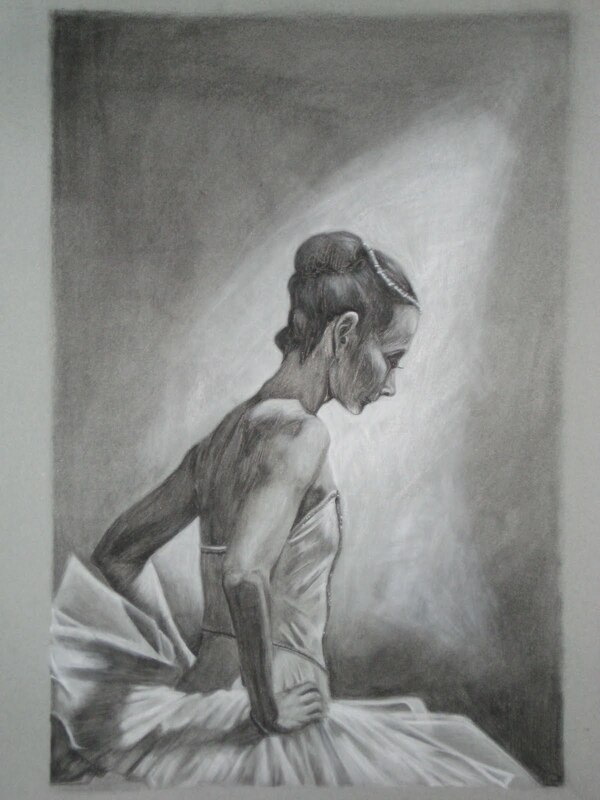 With my first projects, study drawings, and sketches, I used my pencils and charcoals as if they were brushes. I never really defined edges nor had a range of lines or colors. I was not used to having to, nor needing to smear and smudge in order to create shades. It was rather difficult to control the pieces I made. This was obviously a critique I received again. Eventually, I was able to get increasingly better at it and tried slowing down when drawing not just recklessly passing my pencil back and forth as I did with a brush. I too more time to focus on single areas at a time, paying attention to work on values and texture, making it more emphasized. Although, I feel that my skills in drawing still need more work and will most likely aways need improving on, I do feel that it has helped me in accomplishing my goal at being able to implement the skills I learned in this course to my own personal art as will as paintings that I would like to create. This Christmas break seems like an ideal time to try my hand at it. I don’t think I can talk about drawing without talking about painting, and eating, and running (there’s a relationship between all these things, I promise), and that’s pretty much an autobiography, so I’ll just try to make this as painless as possible. Please sit tight. To make things easier I will highlight in bold the important sentences. Growing up, art was never a large part of my life. I remember telling a very surprised friend in Grade 5 that I didn’t know who van Gogh was. My parents, having never had the chance to develop their own extracurricular abilities, tried very hard to give me this opportunity; however, to them this meant going to great lengths to pay for my piano lessons and enroll me in piano competitions, because learning to play a classical musical instrument was the fashionable (and useful) extracurricular in our community. Unfortunately, much to their disappointment, I was, and still very much am, an awful pianist. Then I went to secondary school, where Art was a required course for the first three years. (A quick note on the British education system: we have seven years of secondary schooling—three years of general “middle school”-equivalent education and then two two-year courses in “high school”, each of which ends in a bout of externally-assessed final exams. We start off with 14 subjects in Year 7, which gets narrowed down to 8 or 9 examined GCSE subjects in Years 10-11 and 6 in Years 12-13, under the IB.) That was when I started seriously drawing—and I couldn’t stop. Drawing spoke to me in a way that playing the piano never did, and I found myself eager to spend time and effort on drawing that I actively sought to avoid spending on the piano, even though for this I had significantly more external support and instruction. Probably I was just too relieved there was, for someone so incredibly uncoordinated, something even vaguely kinesthetic that I could do. Trust me, if you’d spent the first eleven years of your life feeling like a failure every time you had to do something remotely physical, you’d be ecstatic too if someone told you that your drawing of a dog looked like a dog. Despite mild opposition from my parents and the knowledge that doing so would take up almost all of my time, I stuck with Art as one of my GCSE examination options and again for IB, although both times I had been convinced up until decision day that I was going to give it up. We’ve all heard the arguments before: it isn’t practical; it doesn’t offer any job prospects; it wastes time. I almost made the grim mistake of being persuaded by them. As it is, looking back, keeping Art in my life was probably one of the best decisions I could have made at that time. I couldn’t have known it then, and it seems melodramatic to frame it this way now, but drawing ended up saving my life. A few months after I made the choice to continue Art for IB, just before I turned sixteen, I came down with some pretty severe physical and mental health problems. First it was clinical depression, which then manifested into anorexia nervosa, and then that brought on a whole host of other ailments and complications which I’d rather not get into right now. You can judge me for having been anorexic, and I’ll judge you for judging me. It wasn’t exactly the most glorious episode in my life and there are still a lot of things about that period which are very foggy in my memory now, but what’s done is done and hey, it didn’t kill me, so it must’ve made me stronger. Anyhow, I like to think that some good things came out of that ugly experience. Amongst these were my strengthened relationship with drawing and my newfound relationship with running. I’ve been asked often how I find the resolve to run so much. The truth is, being able to run now—no matter how painful it gets—can never be as painful as not being able to run whilst I was still struggling with anorexia. I started running as a way to prove that I could, to prove that I was still alive and getting stronger and would become even better than I was before, and also to rebuild my relationship with food and eating. The irony here is that instead of exercising to lose weight, I’ve used running to gain forty-something pounds. And drawing? Well, it so happened that my illness coincided with my GCSE final examinations, which were, to us back then, quite a big deal. Because I was on medication and rather out of it, I was put on a separate schedule from the rest of my year and that meant I had my own studio to work in for my Art final—a drawing. It was in colour pencil and, fittingly, the theme I’d chosen happened to be construction sites. My subconscious seems quite keen to make itself known through my artwork. 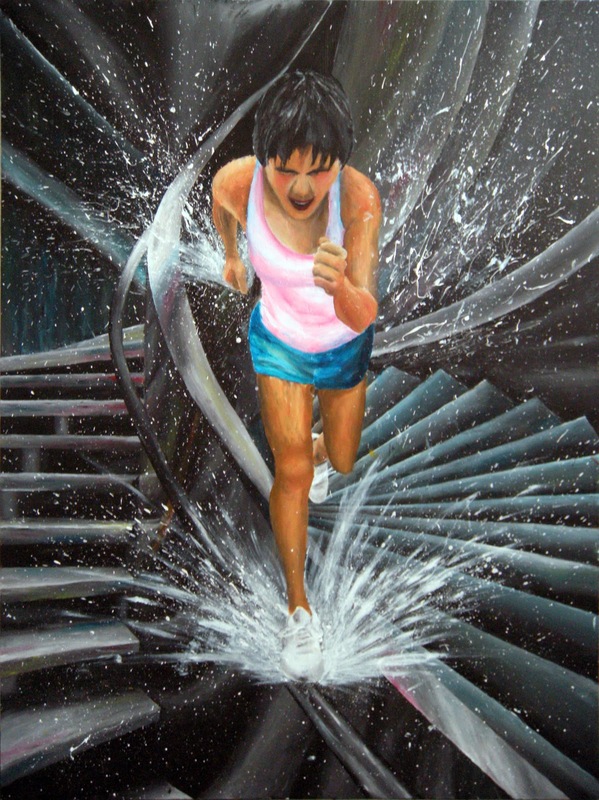 It was very much a time of reconstruction for me: just as I was rebuilding myself intellectually through revamped studying and physically through running, I was rebuilding myself emotionally through art. It was through drawing and painting that I remembered how it was to feel joy and peace and contentment, and rediscovered the beauty in living. It was a tough couple of months but, in retrospect, thoroughly fulfilling. I spent every possible second drawing in order to meet the deadline and still keep up with the rest of life. I would stay for hours after school painting—it was an incredible way for me to unwind from the sheer exhaustion of the day—until the custodians kicked me out, then take the bus down to the municipal cycling track and run ten kilometres home. Then I would eat dinner, do whatever other work I needed to do, and draw until the early hours of the next morning. The combination of drawing and running gives me inexplicable, irreplaceable joy. This 4' tall piece was entirely finger-painted. I gave up on using paintbrushes halfway through senior year. I think that because I put so much of myself into my drawings and paintings, they reflect my emotional state too well—if I am nervous or distraught about something else, I can’t draw. That being said, drawing calms me in a way nothing else can. Usually when I draw, it is a very private experience, and I become unaware of anything except the form I’m drawing, my pencil, and my thoughts. Sometimes, after being ‘in the zone’ for too long, I have trouble readjusting back to the real world, and have trouble regaining my speech and motor functions (please tell me I’m not the only one). But drawing is also very social—one of my favourite things about studio time in secondary school was the sense of unity we shared, that feeling of being connected to each other by the engaging nature of our similar work, yet each being immersed in our own personal worlds. And I learned to draw by speaking and listening to (or, because this was often not possible, reading about) other artists and looking at their work, and I would be lying if I said that I didn’t draw for an audience. It’s a language that is often easier for me to think in than any based on words. It’s kind of ironic that every single time I’ve had to make choices, I make the decision to drop Art—and yet something always draws me back. It’s actually the one thing that has stayed constant in my life throughout these years, and I am so very, very thankful for that. I’m sure that other people can come up with a hundred arguments why I shouldn’t continue, but—at least for me—there only needs to be one reason, and I’ll keep on drawing. Art and drawing have always been a big part of my life. Like all little kids, I loved to draw. But what set me apart from all the other kids was that they grew up and stopped. I did not. And since then, drawing has just become more and more prevalent in my life. I remember during my senior year of high school, I spent so much time drawing, my mother asked if I couldn’t just stop for the year to focus on studying. I could not. Drawing is a part of me. On that note, I have always enjoyed producing art. I do it for fun and I love looking at art, admiring it, and critiquing it. However, drawing classes have never been my forte. I have often compared it to coconut juice. I enjoy coconut (like I enjoy drawing) so I keep on trying the drinks (as I do classes). It always ends in me making a face, hating it, and wondering why I never learn. I do understand that before I have the right to do just anything with my art, I will need a strong fine arts base. But this goes against what I enjoy, and art, for me, is only a part of me because it comes naturally. Once it does not come naturally, it is no longer a part of me. After taking this class, I do feel like I have technically improved. I have never before tackled buildings or flora, both of which have been the subject of at least two of my pieces this semester. Unfortunately, I feel like due to this class, or all art classes in general, I am drained of all energy that I might have used to produce my own original art--art that means something to me. In an ironic way, taking art classes actually inhibits my art-making. Even if the doodles and cartoons that I produce aren’t as quality or frame-worthy as anything I could produce in a studio setting, they better reflect who I am as a person, and I would rather that than ruin my love for drawing by doing something I don’t enjoy. That isn’t to say I had an entirely terrible experience this semester--I am rather proud of some of the pieces I made during this period--it’s just an experience I will not likely repeat in the future. Maybe this time I will learn and continue to do what I have always done: keep art as a part of me. When I was little, like most other Chinese kids my age, I was forced to attend Chinese school on Saturdays, where I would endure 3 hours of grueling classes of repetitive memorization and boredom. However, after these 3 hours, we were allowed to take an elective. At the age of 6, I was a self-proclaimed professional finger painting artist, so naturally, I decided upon art as my elective of choice. For two years, I drew Spiderman and cowboys, until the allure of a Chinese yo-yo class pulled me away. As the years toiled on, throughout middle school and high school, my free time became more and more limited, and thus went towards other things that interested me more. It wasn’t until last year that my interested in art, especially drawing, rebounded in force. I had to draw for a project in one of my classes, and I realized how fun drawing was compared to my other homework and, at the same time, how my skills were a far cry from adequate. Needless to say, I wanted to get better, so that is, in part (or one big part) why I chose this class as an elective. My biggest difficulty at first was simply drawing what I saw. Since the beginning of a term is usually light on work, I was able to devote myself to at least attempting to portray reality as realistic. Throughout the term, I was able to get a solid grip on linework, and the ability to draw forms somewhat accurately. On the other hand, my shading skills has only improved slightly, bogged down by the fact that outside sketches require the assimilation of a much broader and deeper range of information, which simply befuddle me. However, I found the subtractive technique especially useful in creating wonderful textures. In one of my sketches, I attempted to represent the odd shadings of fur on a stuffed animal with this technique and it worked much better than I expected. This class has allowed me to learn a lot of things about art. By assigning sketches every week, I was really able to explore new things. In some weeks, I worked on linework, while on others, I worked on shading, and other still, I worked on my creativity. Despite the fact that my term slowly grew busier and more hectic, I enjoyed working on these sketches because they were not really work, but rather a fun diversion to enjoy myself. All in all, I really enjoyed this class, and would definitely recommend it to anyone who would want to learn how to draw. Although it took huge chucks of time to complete the assignments, it is one of the few classes that I come out with a finished product to display and a skill that I can definitely say has improved since the beginning of the term. I doubt that the me of three months ago could believe I will be able to draw such pieces, but I am proud to say, that I have, and hopefully, I will continue to do so during my stay at Duke and into the future beyond. I've been doing art for a while, but drawing was never really my emphasis. I feel more at home working in 3d or in materials that I can work up and create a surface like oil pastels, collages, and linocuts. I usually see drawing as a preliminary step that I take before I start painting or carving a linoleum cut. Keeping a sketchbook was also sort of odd, because drawing has always been a vehicle by which I plan other projects, but I quickly noticed that my sketchbook drawings were much simpler, less clean, and less detailed than others. I like collecting images when working with a project and doing study drawings, but actually drawing in a sketchbook, instead of writing notes and pasting in images, was completely new. In this class, for the first time, there was a strict emphasis on drawing by itself, and confining work to graphite pencils and charcoal pencils. I've never had that kind of focus on drawing before. I skipped straight out of order into 2d and 3d mediums in high school, and went straight for sculpture and printmaking at Duke. The fact that most of my art required drawing at some stage of the process,ensured I didn't get too out of practice at representation, but it was incredibly strange for me at first, to put together finished drawings that were graphite representations of a still life and no more. It was weird the first few classes, because I still felt like my work was unfinished, because I hadn't made my work into a painting or a print. I didn't have to piece images together, like my other art teacher made me do because of image copyright infringement, I didn't have to worry about mixing the right colors or gluing millions of tiny pieces of paper down. I didn't have to worry about putting enough nails to hold my art together so it could withstand the wind. This sort of drawing was much more relaxing than my usual stuff, because all I had to do was sit and look..
Funnily enough, even though I had much less to worry about, this did not mean that my drawings became neater or cleaner than my previous work since I had less to focus on. If anything, my drawings are more messy, more cartoony, with incredibly dark darks and expressive line work everywhere. Maybe it was because I wanted to make sure that the paper underneath my drawing, no longer had a presence. I wanted to fill it so that it not longer felt like a flat thin surface but was more like a sort of vantage point into a scene. Thanks to this class, I have found that drawing isn't as boring as I would have previously thought.I love the impact of charcoal and of strong value and how it can make a flat piece of paper have depth and 3d quality that I love in other mediums. I've found that the images I draw with charcoal, my new favorite drawing medium are incredibly intense, often turning a regular scene into a more dramatic setting because the values are so strong. I realized that throughout the process, I am constantly stepping back from my drawing and squinting my eyes, to make sure that the values and the spaces remain distinct, even from far away, which maybe is the reason I push my darks so far. I'm often shocked when I compare the way my drawings look far away to how they look close up, because trees from a distance become sharp scribbles of value. I guess that I'm a bit of a lazy artist, so I often try to push how far I can simplify the shape of an object and its values, but still make sure that its recognizable. I have very little patience for detail, so I love drawing high lit scenes, landscapes, and portraits that have lots of shadow, because I can play around with value, and I can also be spared some of the monotonous details. I like taking normal scenes and pushing the values, so that even if a narrative is not present, there is an intensity added to even the most mundane images by simply pumping up the values. Kind of like seeing through a dream, where things aren't entirely realistic, but have such a strong impression on you that they're incredibly powerful. Drawing is... interesting. I'm not sure if I will ever love it as much as collage or printmaking, but I really appreciate the way that focusing on drawing through this class, helped me learn more about my process and my style. My work is messy, sometimes overwhelmingly so, but it has an intensity about it, that I like and find interesting. Maybe I'm just biased :). At first, it was hard because my art looked so different from the rest of the class, but now I'm ok with it. Just to illustrate what kind of messiness, I'm talking about. Here are some images :) This is from a few years ago, but I still like the colors and the mood of it. Both of these below are from this semester both in charcoal. Well, I guess I'll start with a little history. I've been drawing pretty much as long as I can remember. I probably began with little doodles and sketches of my favorite cartoons when I was a kid - Dexter's Lab, Hey Arnold, Pokemon, Dragon Ball Z, etc. I think it was when I got to middle school that I first took art seriously. My county's board of education held an art contest, in which the top student art from each school would end up on that year's school calendar. I drew the space shuttle Columbia (it was the year after the shuttle disaster), and it ended up on the cover of the calendar and got me really thinking about pursuing drawing more passionately. Once I got to high school I kept at it - I took an art class my sophomore, junior, and senior years, and even participated in several art shows locally and state wide (and won some nice prize money :P). I haven't really had a chance to do a lot of drawing/painting since I've been in college, so I'm definitely happy to be taking this class. I think that for me drawing is both a cool way to pass time and a nice outlet for me to hide from the stresses and trivial annoyances of life. I really don't give a damn about my physics homework or my internship application when I'm scribbling away on some new project. As cheesy as it sounds, I kind of get lost in the work - for a few brief hours everything else just doesn't matter. It's just me, the pencil, and the paper. However, I won't say that drawing is always fun and full of warm fuzzy feelings. It definitely gets frustrating, even to the point of me giving up entirely. I've had more than a few works that I've completely abandoned simply because I didn't feel it was going well, or I was in a bad mood. But these instances never steer me away from art - in fact, I feel that all of this is part of the creative process. I dig every minute of it - the good and the bad. Even though I plan on going into the medical field, I don't really want to rule out art as a career path just yet - Ideally, I'd like to retire relatively early from medicine and go to art school, in the hopes of becoming a concept artist for video game or film production - So I'll just have to wait and see where life takes me. But until then, I'll keep on drawing - I couldn't imagine how much more boring my life would be without it. 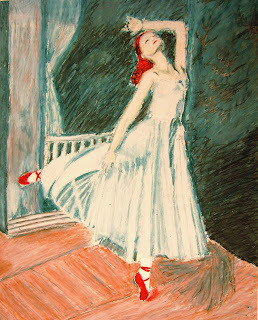 Ever since I was a little girl, I was taught about the importance of art, the importance of expression. This was all taught to me by my father. He taught many students the importance of art and its long history and I was always dragged along to the museums. I have to admit that at first I hated it. But who can blame a little girl for wanting to play outside? My father however had the remarkable ability to make stories come to life, about the lives of the painters – and the hidden stories that were told in the paint. As I grew older, I looked closer. With a hand on my shoulder my eyes became trained to see the techniques of these great artists. Looking and understanding however, was not enough; I had to try it for myself - I wanted to be a part of this magical world. It was when I started that I could not stop. I drew everything that I saw at any moment that I could. My bookshelves are filled with so many journals and notebooks that I can’t even count it anymore. I still remember sitting on the couch as a little girl trying to draw a box that wouldn’t look right, and my dad sat next to me and taught me all about shading. It was in high school when my love for drawing and painting really exploded. I was in a pretty academically rigorous high school and I was going through a difficult time when art became my escape. There is this thing that runners experience after running for an incredibly long period of time called a “runners high”, and this is what happens with art. You get in this zone where all of a sudden there is this vacuum; a stillness that sweeps over you. You draw and the real world is far behind you and it’s just you and the paper. This is what I love about drawing; it’s ability to take you away – to transport to a place within yourself that you never knew existed. My favorite drawings are portraits, faces show so much about a person’s life, but also have to power to clean. I love being drawn into these works because you can start making your own stories for these people – it really becomes an adventure. I also love working with mixed media – using drawing, painting and collage in my art. Throughout my life art has shaped my perspective and has encouraged the perception I possess of the world around me, emboldening me to look deeper into human nature and to explore life beyond appearances. Such observation reveals a unique beauty in every object of my consideration. Watching a form come to life before me by my own hand is the most transcendental experience I have ever witnessed. For this reason I especially enjoy certain forms of art in which I am able to completely immerse myself. I gravitate toward more tactile media. Sometimes while painting I find myself using my hands, arms, or any available skin as a pallet. Similarly, when working with charcoal, I relish blending tones and shaping my creation with my own fingers. Such application allows me to become more fully a part of my work. Drawing is my way of speaking without words. I am a very emotionally centered person. I feel things deeply and at points in my life my emotions seem so overwhelming to deal with and understand. Through art I’ve discovered an avenue to release my enigmatic thoughts and feelings into a concrete form before me. Art is the central means of expression in my life, serving as a sharp contrast and relief from the intense cerebral demands of academia. I attended a high school that did not offer the opportunity to take an art class until senior year. Therefore it was more difficult for me to find artistic outlets. Because of this I value any chance to express myself artistically all the more. This also explains why over the span of my freshman and sophomore years I was engaged in a project with the religious chaplain at my highschool. In my freshman year, he approached me and asked whether I would illustrate a children’s book that he had written about the Christmas story. I eagerly accepted and spent my free time bringing words to life in depictions of Santa Clause, little elves, and the baby Jesus. After the first book came to completion and the religious chaplain revealed his idea for a second children’s book, I once again jumped at the opportunity. These projects throughout my high school career have offered an avenue for artistic expression and have opened my eyes to the art and publishing world outside of school. In addition to these two children’s books, which are currently undergoing the publishing process, I have always sought out other art opportunity in every activity I am involved in. Artistic expression for me is the channel through which I reach out to and connect with the world around me and conversely reach inward and discover myself. Art has played an integral role in my life, shaping the person I have become, and will follow me wherever I choose to go in life. Since I was a child, I have always enjoyed drawing. Drawing was something I would do when I either wanted to impress my parents or just felt like relaxing. In middle school, I started to invest more time into it and decided to take a full year of art in eighth grade. I had a good friend, who's mom was an artist and she hired a professional to give us lessons every month. I guess you could say that my experience with drawing peeked upon graduation from middle school when I won the eighth grade art award, since I decided to pursue a more academic track in high school. However, I will never forget the joy and feeling of satisfaction I got out of the completion of my drawing projects in eighth grade, as I was fully invested in the art at the time. I recall drawing as a way for me to express my creativity and also used it to illustrate one of my deepest passions. This interest was motivated by the fact that I had always wanted to become a famous resort developer and engineer incredible hotels that would put the current five star resorts to shame. 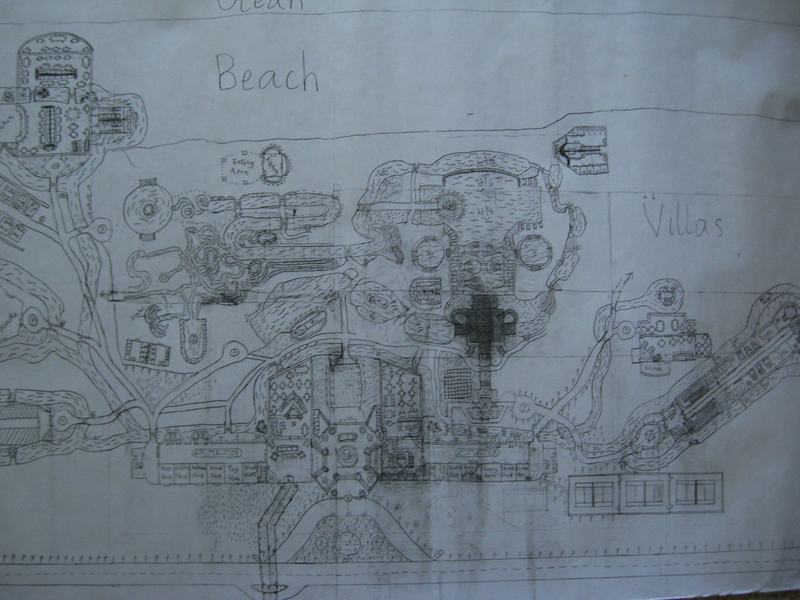 The summer after seventh grade, I spent many weeks drawing out the blueprints to my dream resort, which I called, the "Grand R. T. Spratley Beach and Spa Resort." I was very meticulous in my drawing and spent a lot of time on the small details involved. 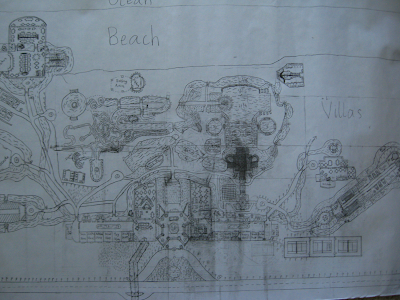 I even spent time drawing parts of the resort in a three dimensional perspective to that the viewer could understand what exactly was drawn in the blueprints. Below, is a scanned image of the blueprints, which ended up consisting of eighth pages total. Today, I still look back on this drawing as a childhood achievement, as it motivated me to work hard throughout high school and get into a good college, where I can study engineering and business together. As a current Mechanical Engineer minoring in Economics, I know that this motivation has payed off and am still working towards my dreams. When I realized that I could take a drawing class here at Duke that would serve as a credit towards my major, I knew that this class was the perfect fit. Working on the projects in Drawing 100 has brought me back to the relaxation and enjoyment that I had experienced in middle school and it's been nice to be able to spend time on something that I would not normally spend time on in my daily life here. Throughout this class, I have also learned much about the different styles of drawing and how every artist has their own approach towards what they want accomplished in their projects. Just looking at the variety of drawings in our class has been interesting and enlightening as there has seemed to be a correlation between our personalities and the emotions expressed in our drawings. It has been a true pleasure to be a part of this class this semester and I am quite satisfied with the drawing skills I have developed and the strategies I have learned throughout the semester that have helped me create good drawings. I was exposed to art at a very young age and latched onto it immediately. My grandmother was an artist so art was very present in my youth. I was given every color crayon imaginable along with finger paints and watercolor sets. I was a quiet child with an unusually long attention span so, even at five years old, I could sit for hours drawing and coloring. I was enrolled in my first art class around age 4 or 5. They told my mom I was too young, but then I sat quietly drawing the whole two hours and they relented. From then on I was always enrolled in some sort of art class and then was heavily involved in my high school’s art program. My high school was very new and had an extensive arts program for a public school. I auditioned for and was accepted into its free after school program called “conservatory.” Local artists were brought into conservatory to teach their craft to me and the other students. We did everything from figure drawing to screen printing, ceramics to portraiture. During this time I realized drawing was my favorite medium. I love the precision and control of it. Even when I paint I have a hard time giving up that control. I use small brushes and work on a small scale. That is something that this drawing class has pushed me in. I usually work fairly small and take a really long time. In this class I worked a lot bigger and a lot faster. Also I usually work from photos if I have the choice which I then grid along with my paper to match. I like to do this because of the accuracy it gives me. I’ve also never worked on such a large space from observation as I have in this class. I tend to do pieces that are very image based. When I was young I drew horses always, then it was ballet dancers (was my AP drawing concentration) and other random objects. I don’t usually depict large spaces with lots of depth or stories. It was a different way to think about drawings though. One of my favorite things about drawing is how different one person can interpret something from the way another person interprets the same things. When I took figure drawing in high school I always found it fascinating to go around and see other peoples gesture drawings or quick ten minute sketches. When everyone was forced to do something that fast without having the time to think it through, their styles were so clear. And this is where I find drawing to get complicated. There is the pursuit of an individual style, something specific and indicative of the artist, but also the pursuit of learning how to draw things correctly, or maybe the better way of saying that is realistically. Ultimately, we think that a good artist can put something down on paper that looks real. And I enjoy that part of art, the making things look real part, just as much as the creative part of it. I love the challenge it poses and the attention to detail it requires. But it takes a certain eye to see the details around us. I know that I see the world differently than my friends who aren’t involved in art. I look at a white shirt and see the blues and purples lingering in the folds and shadows. I see the high contrast that makes metal look shiny and the complementary color schemes on advertisements. I notice shadows and shapes and lighting that other people don’t. And I like that I see these things. I think art has made the world a more beautiful place for me and I kind of wish everyone could see the world through the eyes of an artist. Here are a couple of pieces i've done in the past. The first is a pen drawing and the second a drawing mainly done with charcoal pencils that was for my AP Drawing concentration. "I don't believe in God but I believe in Picasso"